Just a 2-minute walk from the West Exit of JR Narita Train Station, Narita U-City Hotel offers 2 restaurants and affordable air-conditioned rooms with flat-screen satellite TVs. The simple yet comfortable rooms at Narita U-City include a coffee/tea maker and a private bathroom. Free wired broadband internet is provided in the Double Room with Small Double Bed. 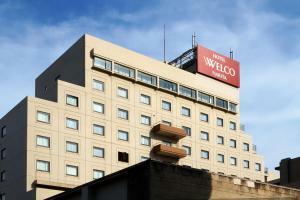 The hotel is a 5-minute walk to Keisei Narita Train Station and a 15-minute train ride from Narita Airport. It provides free parking as well as a free shuttle bus between the hotel and Narita Airport (last shuttle from airport: 19:40). Free Wi-Fi and wired broadband internet are available in the lobby. Restaurant Epinard offers a Japanese and Western buffet for breakfast and lunch. When would you like to stay at Narita U-City Hotel ? Simple yet comfortable air-conditioned room that includes a coffee/tea maker and a private bathroom. Room featuring a small double bed (128 cm wide). Includes WiFi internet access. This simple yet comfortable air-conditioned room includes a coffee/tea maker and a private bathroom. Each day we'll check prices and send you an email for your selected dates at Narita U-City Hotel. If you don't have specific dates but would like to check prices for say next weekend or say next month we can check the price too. Click to write a review and share your experience of Narita U-City Hotel with other travellers.